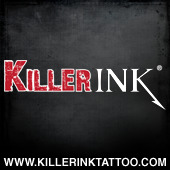 Tattoos : Designs Pictures & Galleries where you can vote/rate real tribal tattoos or free fonts or get a custom design. Tattoo Definition - the marking of the skin with punctures into which pigment is rubbed. The word originates from the Tahitian tattau. Fancy a word and name translated into one of many popular languages for the basis of a tattoo ? We now offer Hindi, Sanskrit, Chinese, Arabic, Japanese, Hebrew, Gujarati. Have our human translators complete your order then get it inked by your favourite artist! Over 2000 tattoo designs and pictures in our gallery. These designs have been created by artists for your inspiration, browse by genre or search for a specific type of design. Images are separated into categories. Why not head over to our Rate my Tattoo area and vote on real free tattoo images, also remember if your going to dish it out you should be able to take it so upload your tattoo image now! We have hundreds of images of tattoos that can surely offer you inspiration and hours of viewing pleasure, some really nice tattoos and of course some dodgy one's! We will let you decide.. Create ambigrams of names, words and cherished sayings for a tattoo. Ambigrams can be read upside down making them ideal for tattoo designs on arms, shoulders and forearms. A FREE stencil is supplied with each high resolution ambigram ordered. A gallery of celebrities and their tattoos. Hundreds of famous people and pictures of their body art, celebrities are listed alphabetically. If your in the business of offering tattoo supplies including needles, ink, tattoo machines & guns then please get in touch if you would like to advertise on this page. We can also accommodate tattoo removal adverts. Looking for some nice tattoo ideas for a fighter or a simply sports lover? Check this website Dek23 for wide range of possibilties: from boxing gloves to a badminton racket. © 2001-2010 Tattoos By Design : Jewellery : Edinburgh Tattoo Tattoos By Design was created to offer you a complete resource for tattoo pictures, images, designs and translations.